Javits Playground Schematic Design Approved! The renovation plan has received final Public Design Commission Approval (May 2017). 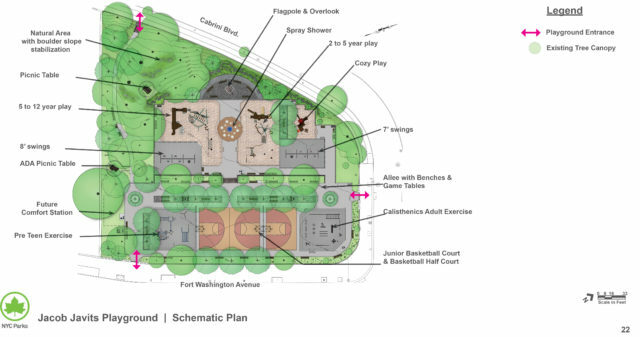 After going through NYC Parks internal reviews, community input sessions, and the Community Board, the Public Design Commission gave final sign off on the Javits Playground project. The project is currently in the construction bidding process. Construction is anticipated to start March 2018 and end Spring 2019. On September 27, 2016, the design schematic for the reconstruction of Jacob K. Javits Playground was approved by the full board of Community Board 12. The $2.45 million redesign project received partial funding from Councilman Ydanis Rodriguez ($1.5 million) and Borough President Gale Brewer ($600,000). The Fort Tryon Park Trust raised $350,000 in private donations to contribute to the renovation. This project moving forward is an example of the importance of private contributions supporting public projects, especially in the parks, which rely on elected officials for their capital budget. We are grateful for the support of Councilmember Rodriguez and Borough President Brewer for the capital funding allocations to this project, as well as our local donors whose contributions enabled the Fort Tryon Park Trust to make a significant funding allocation to ensure this capital project can be brought to fruition. Please support our conservancy efforts by making a donation today.